Certified BPMPs enhance their professional experience by obtaining recognition of their competency, and proving that they are professionally qualified to practice their profession. BPM certification helps employers define job objectives, evaluate position candidates, assess employee performance and motivate employees to enhance their skills and knowledge. BPM certification supports the advancement of BPM professionals by providing a way to measure and document the knowledge and skills required to be recognized as a competent practitioner. Once you become a Certified BPMP, you are able to demonstrate the knowledge and skills to be productive members of a BPM team. These skills include building hierarchical process models, using tools to analyze and assess process performance, defining critical process metrics, using best practice principles to redesign processes, developing process improvement project plans, establishing process governance and building a center of excellence. The BPMInstitute.org Training and Certification Program was recently recognized by Forrester Research as a category leader in providing professionals online and in-person training, and professional certification. This makes BPMInstitute.org the natural choice for proven BPM professionals to demonstrate the knowledge they have - or those new to BPM to gain the knowledge they need to succeed with a BPM certification. The exam covers the elements of the BPM discipline which includes Concepts and Principles, Process Modeling, Process Improvement (Analysis & Design), Process Measurement, Process Technologies (BPMN, BPMS), BPM Governance and BPM Center of Excellence. Certified BPMPs are able to demonstrate the knowledge and skills to be productive members of a BPM team. These skills include building hierarchical process models, using tools to analyze and assess process performance, defining critical process metrics, using best practice principles to redesign processes, developing process improvement project plans, building a center of excellence and establishing process governance. BPM certification requires expertise in many areas. Those who will successfully pass the exam will have approximately three to four years of Business Process Management experience and can demonstrate expertise in each area of the BPM certification coverage map. Take the BPM Skills Self-Assessment to identify your strengths and weaknesses across six critical Practice Areas. You know where you stand if you've completed the BPM Skills Self-Assessment. The study guide will get you ready for the exam. Find out what to expect in the exam with sample questions, answers and explanations. Identify your strengths and weaknesses with this self-assessment. Take any training you feel you need. 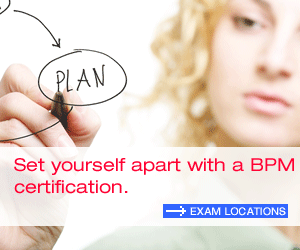 You are not required to take training from BPMInstitute.org in order to take our BPM Certification Exam. Review the key Practice Areas covered in the exam and get the study guide. Take the exam online from BPMInstitute.org.